FBI on mass shootings: Mass shootings seem ubiquitous as of late, and the FBI’s report investigating the rise of active-shooter incidents since 2000 was met with alarm from many media outlets. Its findings are awful, if not surprising: Average active-shooting incidents have increased from six per year to more than 16. But as Jesse Singal pointed out at New York magazine, an “active-shooter” incident shouldn’t be conflated with a “mass shooting.” If you filter the data by context, the picture is a bit more encouraging. 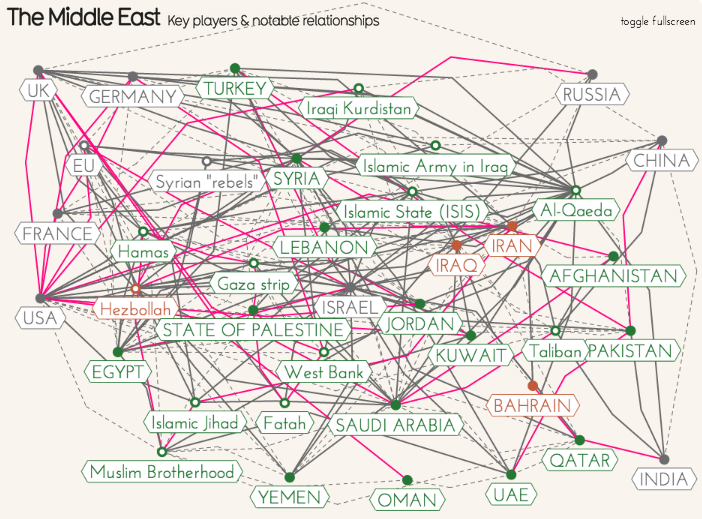 Weaving a tangled web: The Middle East is a complicated web to navigate, and that’s been made even more clear by David McCandless at The Guardian this week. His interactive explainer of the region’s “tangled, opened state is meant as a kind of visual joke, showing how its fabric defies simple solutions.” It definitely makes its point. And while it’s light on numbers, anyone who wants to understand the relationship between Fatah and China or Russia and the Muslim Brotherhood would do well to give it a look. Pour me a cold one (or 74): Do you think you drink a lot? 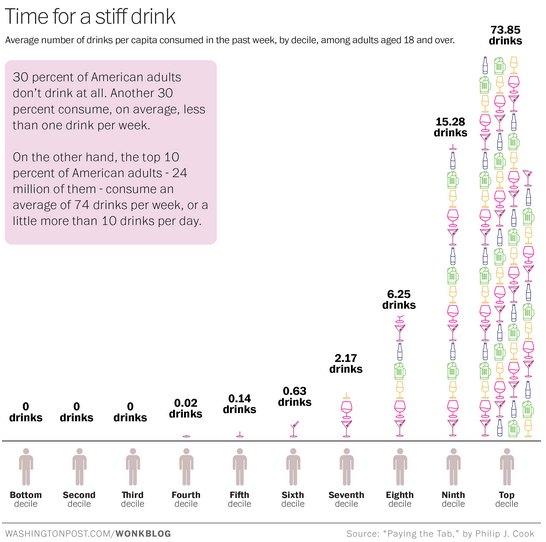 If you consume fewer than 74 drinks per week, then you’re not in the top 10 percent of American adults. Wonkblog’s Christopher Ingraham looked at data from the National Epidemiologic Survey on Alcohol and Related Conditions and plotted it. I’m skeptical about the 30 percent of Americans who say they don’t drink at all — particularly because that share includes 18- to 20-year-olds, who could be underreporting due to social (or legal, in this case) desirability bias. But the end tail of the curve is interesting. One more round: Speaking of drinks, the location-based shopping information company Retale put together an interactive that displays the beer-drinking countries of the world, using data from Japanese beer company Kirin Holdings. The U.S., at 77 liters consumed per capita per year, doesn’t hold a candle (or a glass) to Germany’s 106, Austria’s 108 or the Czech Republic’s 149. On the pizza trail: Political candidates are people, too. They need to eat, and when they do, they like a good slice as much as the rest of us. 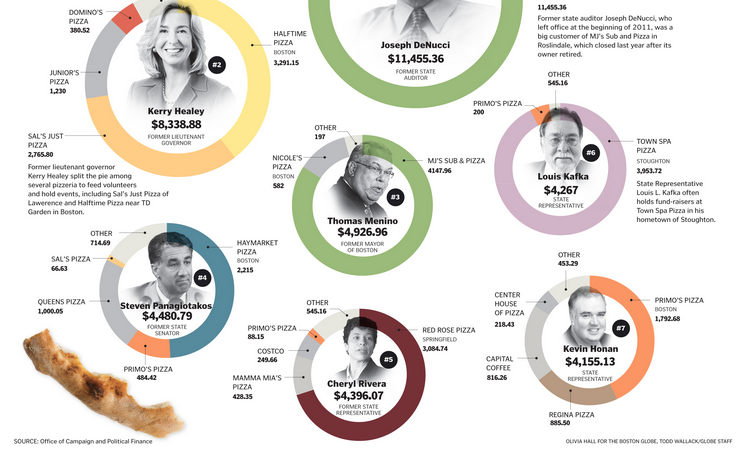 At The Boston Globe, Olivia Hall and Todd Wallack investigated the question of just how much of Massachusetts candidates’ campaign funds went toward pizza. They found that political hopefuls have spent more than $400,000 at pizzerias since 2002.